The recent upgrade involved a complete overhaul of the facilities, from the moulding equipment to cooling and shakeout systems. “By boosting outputs, we’re better placed to compete with our overseas competitors which is part of a long term strategy to increase our position in the ag market,” said Garth Keech, Director of Manufacturing. When it comes to innovations, Keech set a new standard in the market as the first manufacturer to launch a range of direct drilling and deep tillage parts in 1968. “The two part system sees the actual ground engaging point connected to the machine via an adaptor. The system was the first of its kind, allowing growers to replace the worn ground engaging points as needed, without having to throw away the adaptor if it was still in good condition,” Garth said. “While the system has since been copied by other manufacturers, Keech retains its reputation for quality with our parts cast using tungsten steel to a scale of 500 Brinell, the hardest steel on the market. For growers operating in extremely tough environments, the Keech range is also available with optional tungsten carbide tips for extra strength. To ensure the strength of all products, the range is cast in an arc furnace which removes unwanted elements from the steel such as sulphur, phosphorous, hydrogen and nitrogen that might otherwise weaken it. The furnace uses three 20 cm graphite electrodes, producing heat of about 6,000 degrees Celsius to melt and refine the scrap steel. All molten steel samples are analysed with a spectrometer and alloys such as nickel or chrome are added to bring the steel into line with the particular specification prior to casting the points. 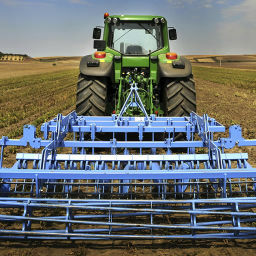 Mixed farmer, Steven Deutcher, has used the system for the past 15 years after Keech was recommended by a fellow grower. “Around 200 hectares across our 3,000 hectare property is extremely tough, with rocky soils making it difficult to sow our annual mix of barley, wheat and oats,” Steven said. While Steven has never measured the lifespan of his Keech ag points, their performance in difficult and rocky areas has kept him coming back. .
Keech’s range of direct drilling points includes knife blades, single shoot seeding points and winged seeding points varying in length, width and angle to suit individual seeding systems and soil types. Deep tillage components available include a wide selection of shank assemblies and accessories with optional tungsten tips for growers working in tough soil types. Right across the range, a choice of adaptors are available, enabling the Keech’s range to be fitted to a wide variety of equipment. All products are sold and supported by a dealer wide network. Go to www.keech.com.au for more information.